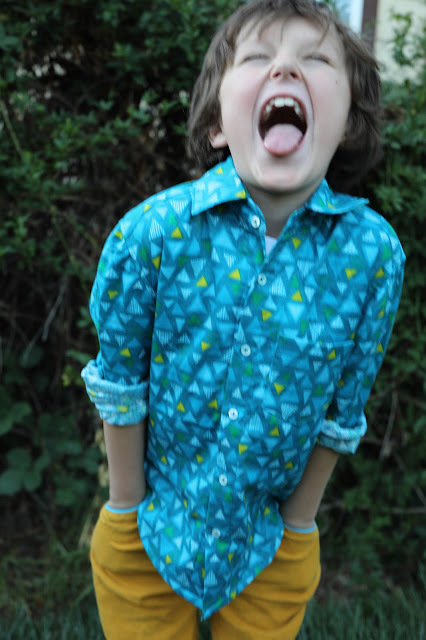 Inder Loves Folk Art: School Photo: Oliver + s Buttoned-Up Button-Down. 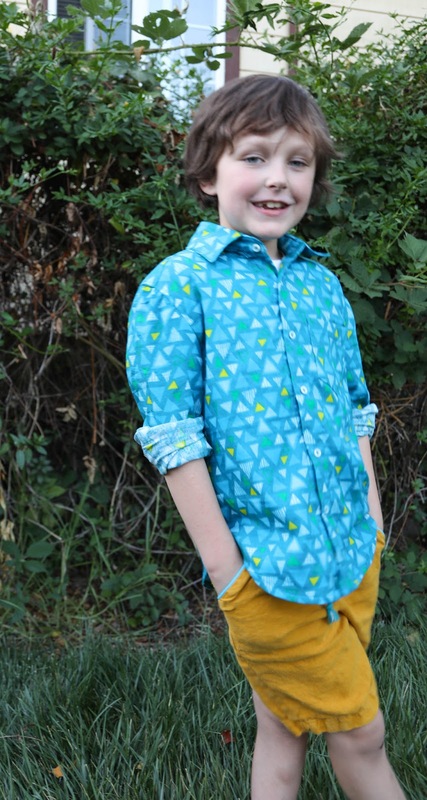 School Photo: Oliver + s Buttoned-Up Button-Down. Hi everyone! After finishing Maggie's Class Picnic outfit, I decided to make Joe another collared shirt to wear for his upcoming school picture. I was planning to use the Sketchbook Shirt pattern, as I did last year (making shirts two years in a row: is this becoming a tradition? ), but before I had a chance to get started, the new Oliver + s pattern, the Buttoned-Up Button-Down, was released! The timing could not have been more perfect (except that I didn't have enough time to wait for a paper pattern to arrive and had to download it, so I guess it could have been a tiny bit more perfect? but I'm not complaining). It has all the details I've been not-so-subtly bugging Liesl to include for years: a separate collar band and collar, tower plackets, more pocket options. As soon as I saw the new design, it was a case of "you can't take my money fast enough." Last friday morning when it came out it was like, BOOM. Downloaded and sent to the printer. Okay, now I can put my clothes on and go to work. 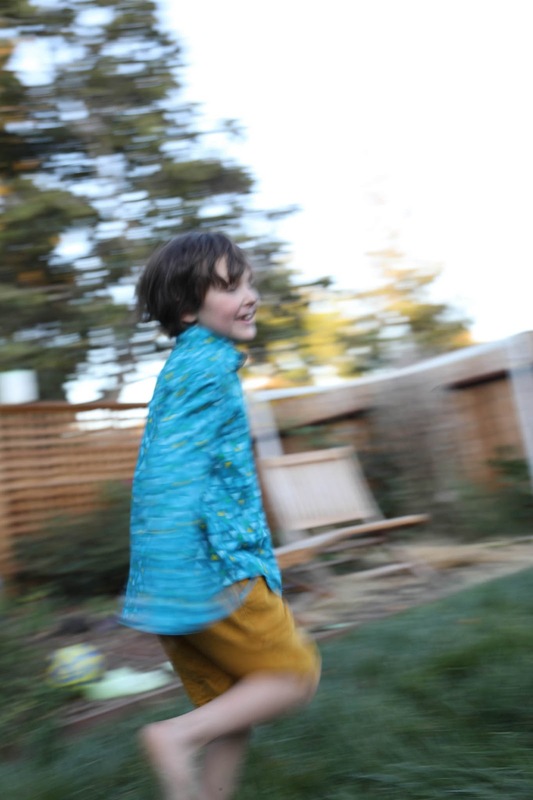 Liesl has mentioned in the past that boys' patterns don't sell as well as girls' dresses, and sewing for both a boy and a girl, I intuitively understand this. There is just more variety in girls' patterns, and dresses are fun and easy to sew. 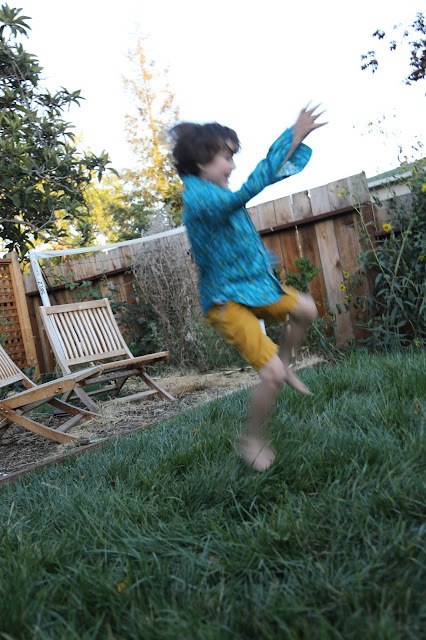 Whereas boys' patterns tend to be more basic, and more similar to each other. And perhaps not as ruffly or exciting in the cover art. In our culture, boys and men are more conformist or "normcore" in their dressing. But as a long time boy-clothes sewer, I also know that this is the big draw of boy's sewing. Because the styles aren't as varied and involved, the subtle details tend to shine more: the colors and fabrics and accents take center stage. There is something really enjoyable about sewing understated, classic styles with fun details. And although Joe would prefer to wear t-shirts, knit shorts/pants, and sweatshirts every single day (and this is exactly what he normally does), he looks insanely handsome in a proper shirt. The issue, as always with Joe, is making him something that is comfortable enough to wear more than a couple days. He's always been, ahem, insanely picky about clothes. He's not a big fan of woven fabrics, full stop. He prefers soft knit fabrics. And he's definitely not a fan of collars. Especially in woven fabrics. So getting Joe to actually wear a button down shirt can be a challenge. With that in mind, I chose a Lecien double gauze for this shirt. I bought this fabric last year, I believe, and I honestly don't remember where. At first, I remembered A Verb for Getting Warm, but now I'm wondering if it was Imagine Gnats? I don't know! It's not on either of those websites now, although I found a different colorway here. Anyway, it's very soft and pillowy stuff, and I definitely bought it with a (short sleeved) shirt for Joe in mind. I was hoping it would be very soft on his skin. I was delighted when I was able to squeeze a long sleeved shirt out of this piece, which cannot have been much more than two yards, since I find double gauze is cool when it's hot, but quite cozy when it's cold. Plus, I wanted to try those tower plackets. Of course, sewing this pattern with a very poofy and soft fabric like double gauze (or flannel) means that you may not be able to get crisp points or details like you would in a shirting fabric, so my tower plackets ended up a bit soft, but that doesn't bother me. I found this fabric easy to sew and the print makes it very forgiving. Okay, so let's talk pattern details, shall we? Given that I was using a quite thick double gauze with a busy print, I opted to make View A, the simpler dress shirt option. After measuring Joe's chest and waist and the desired shirt length I cut this out in a size 6. 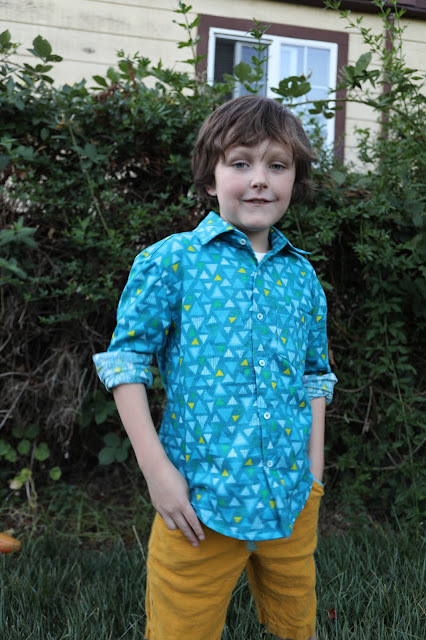 Joe is 8, but he is average in his class of mostly 7 year olds and wears size 6 in RTW clothes. The size six is perfect in terms of hem length for my tastes, and the sleeves are amply long on Joe. My one little nit? I do feel like this shirt is a bit wide in Joe's shoulders. After looking at the shirt on the pattern testers, it seems like the shirt is intended to be a bit wide in the shoulders, but it seems especially wide on Joe. If I make this again I may reduce the width somewhat. If a pattern is intended to have a dropped shoulder, usually the top of the sleeve has a shallower curve and less easing than this sleeve. So I think I would prefer it closer to the natural shoulder line. But I wouldn't want to go down much in overall size because the neck fits perfectly on this shirt. I must read up on narrow shoulder adjustments! That said, I think this is one of those issues that only I will notice. As always, the instructions in this pattern are excellent, and Liesl walks you through all of the steps carefully. I like her technique for attaching the neckband/collar and cuffs. This was really a lot of fun to sew, and although I was on a short timeline, I enjoyed the process and finished it in time for school photos! I admit, when I put this on Joe, I freaked out a little bit. IT LOOKS SO GOOD!! I was totally proud of this make, and made all the adults in the household admire it, possibly more than once! And then I posted a rant about how awesome it turned out, and how gorgeous my kid is, to my Facebook sewing group (thank goodness these are good friends!). I was MIGHTILY PLEASED WITH MYSELF, seriously! Button down shirts are a lot of work, and not the fastest project, but the pride I feel when I finish a shirt full of awesome, profesh, shirt-y details? Priceless. How does Joe like it? Well, he enjoyed the photo shoot! It seems that he can move quite well in this shirt, thank you very much! 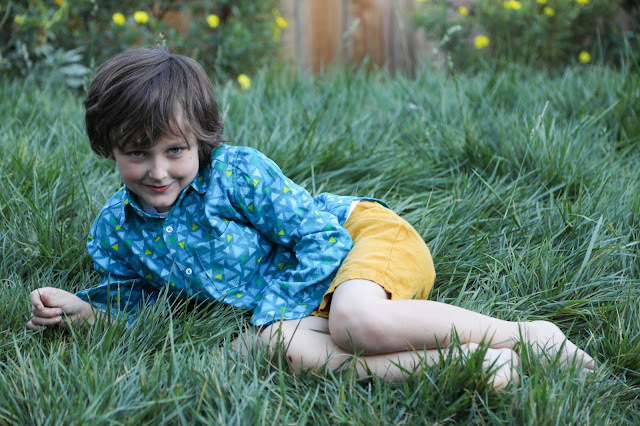 And he happily wore the shirt (over a plain white t-shirt) for school photo day, and didn't take it off until he got home (even though it was a really hot day!). And I never heard a peep about the collar bugging him. So I'm considering this a win! Whether he'll wear it without me specifically requesting it remains to be seen. Just look at that face! Just say the word, kid. I am putty in your hands! I know, I know, the shirt is fine, but it's all about the model, right? Unfortunately for my future career as Hollywood child model mom, Joe is too shy to do this professionally. But don't worry, there was plenty of this too. He is 8 years old, after all. If you have boys and you haven't sewn them a button down shirt recently, I heartily recommend this pattern! The ego-boost you will get is amazing, and of course, if they like it too, that's just gravy. What are you sewing these days? Nice one Inder! So glad you got the shirt pattern you were after. Wow, that is a gorgeous shirt! He looks so handsome and grown up. I hope you'll get to see him wear it regularly. I'll be reasonably happy if he wears it to a few special occasions - I've learned not to push my luck when it comes to clothes with Joe! But despite the fact that it probably won't be worn super often, I really enjoyed sewing it. 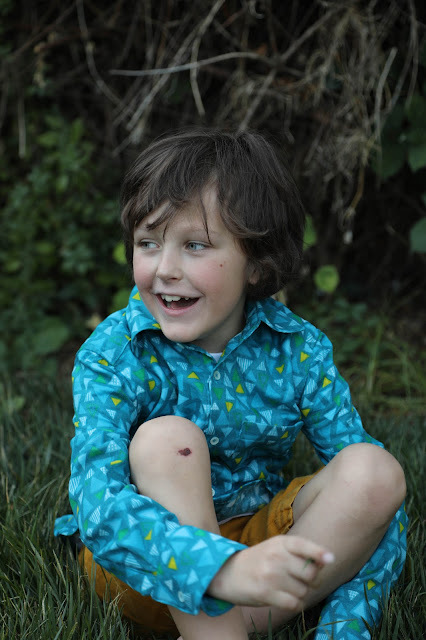 Hopefully when Joe is older he'll want me to sew him more lovely shirts. and satisfying sew, and I do have a very handsome model. I wouldn't want to make men's style shirts all the time, but I really enjoy the process! This is a great shirt! I hope it sees lots of wear! We are in a non-button up shirt phase so I’ll have to wait to try this one out. Oh I hear you there. 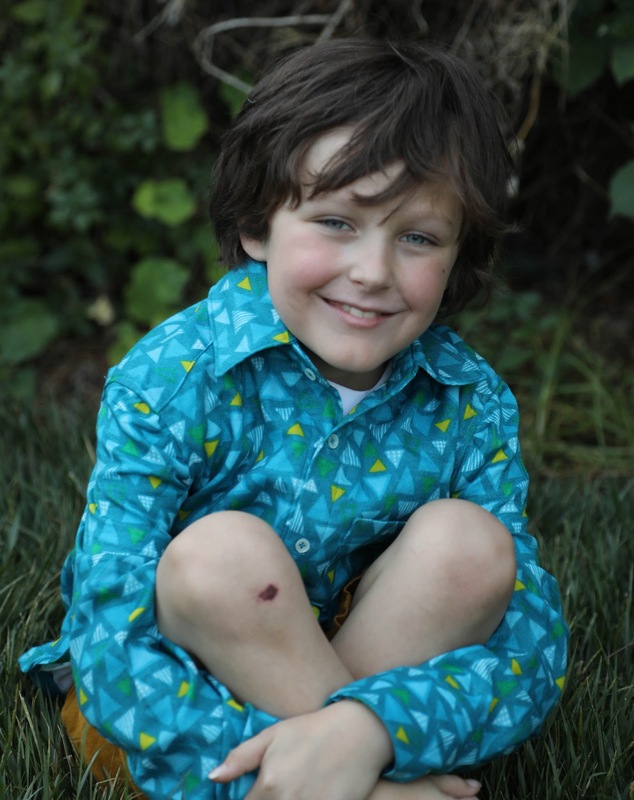 I've told Joe he can wear t-shirts for 363 days a year, but he needs a collar for school pictures and Easter. It's tough! I love it, and Joe looks so gorgeous. Those are totally his colours! I didn't notice the shoulder thing until you pointed it out but that would bug me, too. I feel like a proper fitting shoulder on a shirt is one of the reasons we sew! I'd be interested to hear why it is designed this way, if it's intentional. I like the look of a dropped shoulder on a men's shirt, but then this sleeve head is much too high, with too much ease, for that look. I am wondering if I could nip in the shoulder width a tad, but also take off some of the sleeve head, to create a relaxed, slightly dropped shoulder. Interesting puzzle! He DOES look insanely handsome in this short. I have to say I am super-impressed with you making this shirt out of double gauze. I find it grays like crazy and given all the sharp corners in a button-down shirt, it had to have been frustrating. But it looks great and you made it comfy for him. Awesome job! You know, this Lecien double gauze is soft, but it's not nearly as wrinkly and fray-y as some other double gauzes I've worked with. And I admit, there are no sharp edges on this shirt! It's especially noticeable with the collar and tower plackets but I can live with it. I look forward to sewing this in a crisper fabric - maybe a lawn would be soft enough for him? Fabulous shirt and suits Joe perfectly. His eyes! I agree with everything you are saying about boys' patterns, especially about the details. 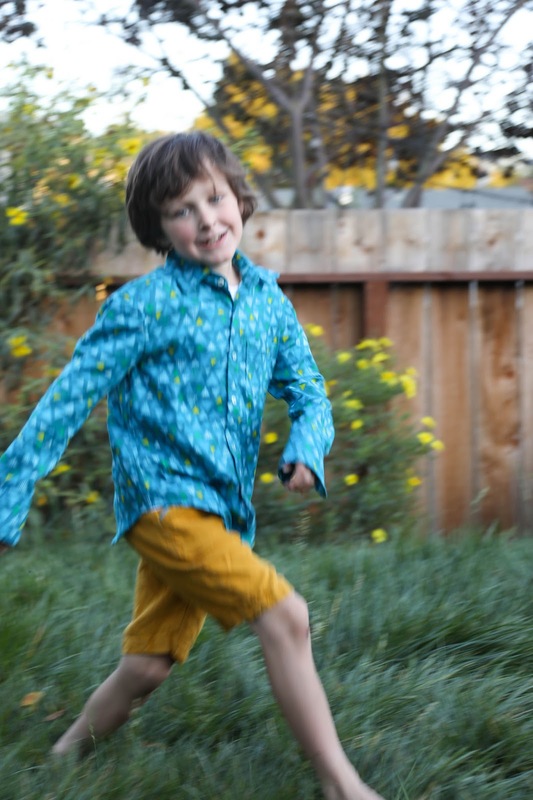 If I sew a funky enough button-down shirt for my little boy (who loves button-down shirts), could I inspire my big boy to want one too? 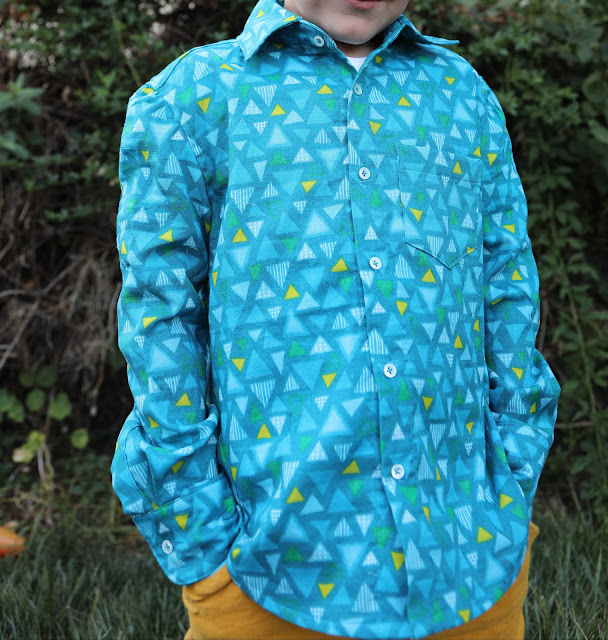 Oh yes, I can see your little guy in a very funky button down, maybe with a bow tie and suspenders! As for the big guy, I recommend laying down the law for school pictures and Easter (the only days requiring actual shirts in our house, t-shirts are fine for the other 363 days of the year) and then, for good measure, use flannel or double gauze. And definitely don't require a bow tie. Good luck!!! This is so nice! I love the fabric, the shirt really looks amazing. Thank you! The fabric is really nice. Soft to wear, but less fraying or wrinkling than other double gauzes I've worked with. This was a really fun sew! First day of Class (Picnic).